What do I do with my kids?! If you’re like me, going back to work after having kids was a hard decision. Ultimately, every parent has to make the decision for what works best for them and their family. A huge part of that decision is figuring out where in the world can you send your kids during the day? Who is going to watch them? How much will it cost? How can I guarantee they will get the best care? There are SO many questions when it comes to finding quality childcare, so I thought I’d help a little bit and give you an overview of some great daycares in Bossier City! There are quite a few options, but these below come highly recommended and here’s why! That is the mission statement from Little Sprouts Nursery & Schoolhouse and according to Brianne Lucius, they live up to all of it! “The quality of childcare is amazing here! It never felt like I was leaving him at a daycare center. It felt more like I was dropping him off with some friends, and that what I truly appreciated about Little Sprouts!” said Brianne. This Bossier City daycare boasts excellent parent/teacher communication and academic structure. They have cameras in each rooms so parents can check on their kiddos virtually any time of day! 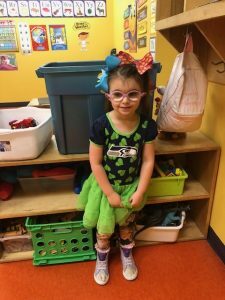 If you are looking for a solid curriculum and teachers who love their jobs, look no further than Little Sprouts Nursery & Schoolhouse. Kaeli realized Cornerstone was the best fit for her little one when she could drop her daughter off in the morning with a smile on her face. Kaeli and her daughter are happy to be apart of the Cornerstone CDC community, so give them a try! Bedrock Academy opened in Oct. 2005 and is locally owned and operated. It offers care for kiddos ages 6 weeks to 3-years-old and also after school programs for ages up to 12 years old. Ashley also mentioned that she loved the security and the teachers that loved on her little girl! First Friends is known for its quality care and affordable pricing. If you are tight on a budget and worried about how to pay for daycare, definitely go check it out! I have never heard a disappointing word from a parent about First Friends. Rachel also noted that the academic change in her son from beginning of the year to the end was astonishing. This learning center appears to be a warm and welcoming place with lots of teachers who really care about your kiddos! This unique childcare development center is located in the heart of Barksdale Air Force Base. If you don’t have any military affiliation, you may not be aware of all the cool programs the Air Force can offer; this specialized CDC is one of them! 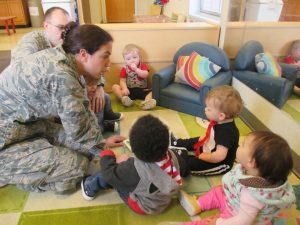 Only authorized for use by military dependents (a child who has one or more parent in the US Military), this day care offers individualized pay rates, excellent care and the highest standard of teaching. If you are a military parent, you should definitely check out the CDC on base. Located in North Bossier, Asbury Ark Academy does daycare and preschool. They even offer part and full time care for most age groups. My son attended a few years ago and I loved the kindness and all around southern hospitality of Asbury Ark Academy. They really cared about my son and he has made lifelong friends from his time there! Asbury Ark is situated off Airline Drive behind Asbury United Methodist Church. It is the perfect location for kiddos in the northern part of Bossier. Make sure you register early though because Asbury has been known to fill up quickly and I have even seen parents camp out the night before registration to be first in line! These are all great daycares in Bossier City that you can check out. Don’t forget to visit Hulafrog for more local kid fun in the Bossier and Shreveport area. Erin Beene is the founding Managing Editor of Hulafrog Shreveport. She is originally from Texas and has a background in event coordinating. She is the mom of two little kiddos and loves getting out to find fun things to do. At Hulafrog, their goal is to highlight all the family friendly events and businesses in the area. I believe First Friends is “First Friends Christian Learning Center” at FUMC Bossier at 201 John Wesley Blvd. You are right. Thank you for catching that error Lori. We’ve updated the blog with the correct address.